I used to be a firm believer that “everything happens for a reason”. But when I say ‘used to’, I am referring to a fifteen year old me who would’ve been posting Marilyn Monroe quotes on Instagram in search of likes if Instagram had existed back then. But obviously now I’m a lot less sure. It’s like the whole medicine versus religion debate, a bit, isn’t it? If there is a God, how can he give people cancer? But then there are medical miracles that no one can explain. It isn’t something that any of us can really, definitively answer. I’m not hugely religious, but, as happily as I would acknowledge that there is far more out there in the universe than any of us can hope to ever understand, I do now feel a little uncomfortable with the concept. After having already suffered myself and caught glimpses of the far worse suffering that others have experienced around me, I’ll admit that I am unsure why any God would inflict such suffering on good, kind people. If you’re not religious, you can turn your attentions to the concept of karma, instead. Is it true that what goes around comes back around to haunt us? Does everything happen for a reason? I’ve done some fairly bad things in my life. Selfish things. I haven’t always paid enough attention to what other people are going through. I’ve been snide and horrible to my siblings on bad days. But I feel like I’ve done enough good things to balance these out. I used to spend hours on the phone to a friend in school, helping her with her homework because she couldn’t do it and I was too afraid that she’d hate me if I said no and put myself first. I’ve always put a lot of effort into making the birthdays of friends special. I’ve never done drugs, committed adultery, murdered, stolen. I have come, all too recently, I’ll admit, to learn to truly appreciate my family. These, and many other good things, are the reasons why I would never call myself any kind of moral saint (I’ve become obsessed with Justin Bieber, for goodness’ sake), but I certainly wouldn’t condemn myself to this kind of stress and worry either. But then you look at the other side of it, which is that maybe illness didn’t happen to me because I was a terrible person, but because I just wasn’t quite good enough. Am I missing something? Am I taking life for granted? Am I not appreciating everything I have enough? I think we’re all guilty of these small sins. Guilty of watching too much Friends instead of getting out of the house and litter picking or volunteering with disadvantaged people. Guilty of dwelling on a petty argument with your family instead of thinking about how lucky you actually are to have family at all. So yeah, okay, maybe I haven’t appreciated everything that I have enough. Maybe I’ve let life pass me by instead of appreciating it. So maybe, on some level, this is some kind of lesson meant to make me appreciate life more. Because I will. I already do. I appreciate every night out that I get to go on with my friends and feel incredibly normal. I appreciate every single conversation I have with my parents that isn’t about blood tests or what my consultant thinks. I appreciate massively that I can buy Christmas presents knowing that I’ll get to watch people unwrap them from the comfort of my family’s living room, and not from a hospital bed, something I was particularly terrified of. And when all this is over? Well, for a while I may not even know what to do with myself and what to talk about with my friends. But it’ll be wonderful and I know I’ll appreciate life more, put it that way. I’m determined that, although I’ll come out of all this pale and bald, I’ll come out having learnt something. And yet (and I promise this is the last curveball), mostly all this just makes me irritated. Irritated that I’ll lose my whole morning to sleep and can’t even always blame it on being a lazy student. Yeah, maybe it was all sent to teach me something, but I don’t feel that I’m so much more selfish than anyone else, and I will never really feel like I deserved this, and nor does anyone I know. 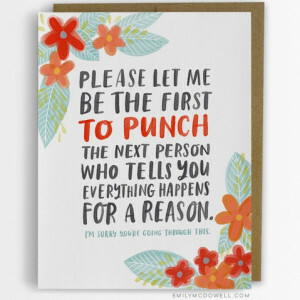 So that’s why I’m pretty sure that things don’t happen for a reason. I think life is beautiful and vibrant and random, which is usually a great thing. But as my family have experienced, it isn’t always wonderful. Stuff happens and there’s absolutely nothing you can do about it. So I just have to take what little I can get from this whole experience, and remember that, in a lot of ways, I’m luckier than most. 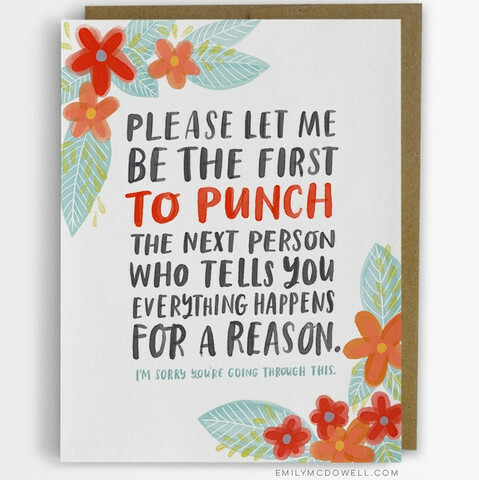 Online shop Not Another Bunch of Flowers have a great selection of empathy cards. You can shop them here, but this one is my favourite. I’m lucky enough to have supportive family and friends that this hasn’t been said to me. But I think I can conclude that I’d be fairly irritated if someone did. © 2019 Alice Byron. All rights reserved.